These movers and shakers in the local food industry share with us their insights and expectations for 2015. I read your last column on marketing trends for 2015 and was wondering if you could do something more food inclined. I currently manage a diner in the province and wanted to get a pulse-check on things before figuring out which direction I want my venture steered towards in the following months. First and foremost, I can’t even begin to think of how much gratitude I have for people like you who treat my column as an invaluable source of key industry insights, as I took it upon myself to serve as a guide for startups and young ‘restropreneurs,’ who not only seek revenue, but who are looking to mature into strategic players in the local (and who knows, maybe even global) economic landscape. I have big dreams for individuals like you and I appreciate your seeking my help. As for your request, I thought I’d shake things up a little and grab this as a chance to have entrepreneurs see things from the perspective of our local food industry rockstars. 2015 is an exciting year, with all the changes bound to happen, and the industry growing ever more dynamic. So read on and take a whiff of what the year has in store. Get a closer look at the trends and key developments likely to impact the local food landscape this year, straight from the movers and shakers of the Philippine food industry. Adolf Aran, Jr., food industry consultant and Courage Asia president predicts that the country will experience an influx of new players with more exciting concepts. He says that this exposure is set to globalize local perspectives, introducing them to a new set of standards, and will then, in turn, allow global brands to be localized with elements drawn from the locals. Ultimately, this leads to our country becoming a global marketplace where large foreign chains share a healthy competition with emerging homegrown concepts. Adolf’s latest project, DINE Philippines, the country's only traveling food business seminar, is actually a movement designed to spur the growth of food entrepreneurship. 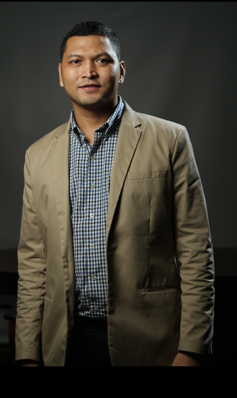 Furthermore, seasoned marketing practitioner and certified foodie Alex Dan Tacderas adds that the integration will “even out the playing field and therefore, have the local players battle it out with the bigger players in more maverick ways.” Maginhawa St. in Quezon City, Kapitolyo in Pasig, and Aguirre St. in Parañaque are the proponents of this trend. Meanwhile, Chef Jonas Ng believes that the integration will bring access to raw materials not available locally, which will then introduce more flavors to the Filipino palate, further elevating their culinary discernment. 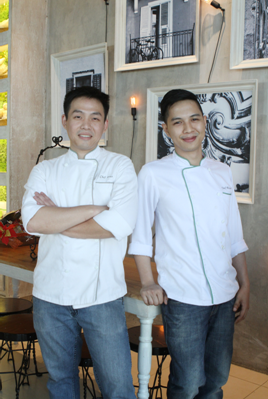 Chef Jonas Ng and Chef Hasset Go of Le Jardin Manila, a dining concept that serves everything from scratch, using locally sourced materials for sustainability. 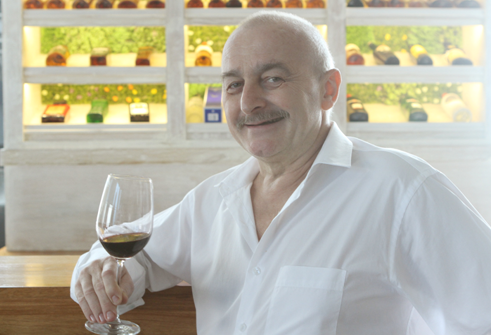 A penthouse garden-themed French restaurant, Le Jardin Manila is partly-owned by renowned French Chef Gils Brault, known for one of the most celebrated restaurants in Ho Chi Minh, Trois Gourmands. 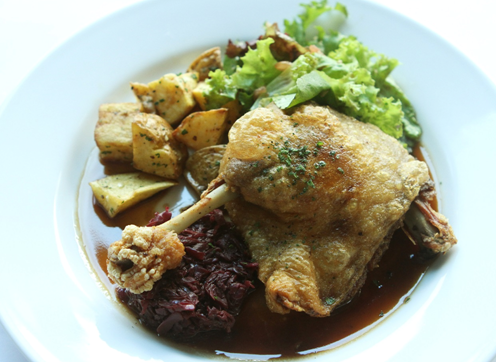 Le Jardin’s duck confit is made using organic duck from Davao and Gen San tuna. Chef Jonas even hinted on the possibility of serving local foie in the future. As per Adolf, the comforting nature of the local cuisine and the growing global recognition of our dishes (sisig, lechon, and sinigang) contribute to more food entrepreneurs opening new restaurants with different twists. Concepts that recently opened that showcased a revisiting of the Filipino cuisine, some of which are regional cuisines in nature, include Purple Yam Malate, Chef Tatung, Victorino's (Ilocano), Maximo, Tiago's. Abba Napa of the Moment Group comments that for 2015, “going local & getting and working with the best ingredients around you will continue to be a driving force, hopefully, not just for flaunting as a buzz worthy concept but for really embracing the values of what going local stands for.” Something we’ve constantly been pushing for, local sourcing and sustainability gave birth to the now trendy locavore culture. This is apparent with the steady patronage of regional delicacies and locally manufactured products, and now with even a new category: locally crafted liquor. Healthy eating is on an all-time high and will stay for long, especially in 2015. “Five years ago, we did not just see the rise of spas and wellness centers; we have also seen the rise of many food products and restaurants offering food that promote better health,” Alex shares. This spurred the popularity of your diet delivery programs, healthy juices, detox concoctions, and what have you. Alex adds that, “the trend to go back to how our forefathers lived also became prevalent and therefore, the search for more natural food sources that can ignite the body's ability to fight toxins. The rise of natural juicing of fresh fruits and vegetables, natural yogurts, or seeds and legumes eaten by early civilizations has become very common that restaurants made it a common fare.” For Mark Gamboa, organic and healthy eating will gain more interest due to the "self and wellness" trend. In addition, more “slow food” advocates are expected to emerge, with the booming economy and the improved spending power of the growing middle class, giving quick service a decline. 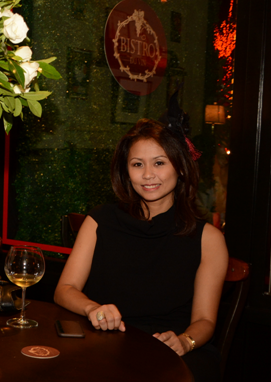 New casual dining concepts will encourage other food entrepreneurs to experiment on various global cuisines, like what Bawais, Banois, and Le Family did for Vietnamese, Madeca, Silantro, and Gostoso for Mexican, Gaucho and La Cabrera for Argentinian, Greeka Kouzina for Greek Mediterranean, and Don Andres for Peruvian. “With ‘Millenials’ occupying the majority of the market, achieving high loyalty on brands will be a challenge,” shares Mark. To which Alex adds, “Manufacturers and entrepreneurs alike will be fighting for their share of the consumer's wallets which have now become more discerning, more discriminating and even choosier. The advent of open media has given a more powerful consumer who can now demand for bigger benefits on the goods or services she is looking for.” Abba also acknowledged the fact that mobile technology is playing a larger role in our industry, which can possibly re-engineer the way restaurants communicate with their target. Meanwhile, Mark recognized Traffic, Technology and Time as big factors that will influence the decision making of a restaurant’s target. Appealing to millennials might prove too great a task, but a sure way to have them respond is to frontload the human factor. Abba shares the human factor will start to play an important role - recognizing and putting the people behind the food alongside the food itself in the storytelling. “And by people, we mean not only the talented chefs, but also the talented ‘front of house’ teams, sommeliers and bartenders - everyone that makes up the ensemble cast that make a restaurant what it is.“ Aside from the social media savvy millennials, Food entrepreneurs now have a different category to entice: the Gen Zs or the digital natives. Abba says, “Diners are getting more informed and they are also starting out much younger as well.” Younger teens now have a say where and what they eat so restaurateurs have to work on an additional market to appeal to. Abba Napa shares that for 2015, Moment Group will be expanding its existing brands, along with introducing new concepts, both homegrown and international. 8Cuts, a concept under the Moment Group which opened last November 2013, will be coming to more neighborhoods this year. 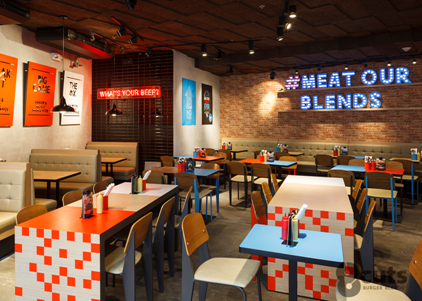 8Cuts serves custom-blended handcrafted patties that are freshly ground, hand pressed and seared to order. In conclusion, our food industry rockstars all agree that for startups to weather whatever challenge this year might bring, they just have to keep in mind three simple thing: to keep things real, to stand for something, and to know who it is you want to serve. Trends come and go, concepts tend to be a huge hit or a massive fail, it’s passion you must continually ignite and develop. To succeed, all you need is to nurture a desire to better your service, and innovate for the sake of touching more lives and serving them in the best way possible.